The Counter Manager is designed to collect data from up to 16 Counters located in the local area. It is a web page server which can be viewed using your normal web browser software. It requires an electrical power supply. (It is not battery operated). It also requires a 10baseT Ethernet connection. The Counter Manager must be assigned its own unique IP address as part of the setup operation. The Counter Manager functions as a data logger with all data stored within the unit. All count transmissions are CRC-16 error checked to insure data accuracy before use. Counts are grouped into periods of ½ hour for the first 3 months. The readings may be aggregated into hours, days, weeks, months, etc. for display purposes. After the three month period, the counts are converted into daily totals. Daily information is available for up to 1.5 years. All information may be exported to a comma delimited file for use by other programs. 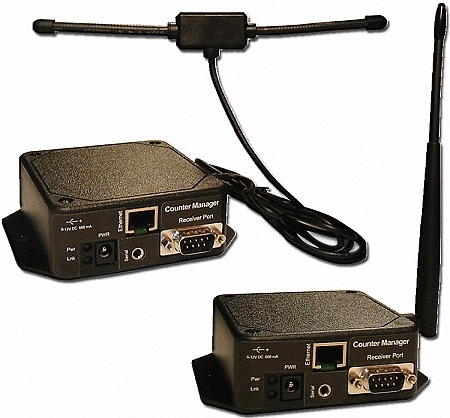 The Counter Manager comes in 418 MHz version, 433 MHz version, and 900 MHz versions. The 418 MHz version and 433 MHz version have an indoor range of up to 200 feet depending upon environmental factors. The 900 MHz has a typical indoor range of 1,000 to 1,500 feet. It complies with Part 15 of FCC Rules.